Pompe doseuse numérique à débit constant réglable manuellement, débit proportionnel selon un signal externe (4 ÷ 20 mA) ou une impulsion numérique (par exemple de compteur d'eau). 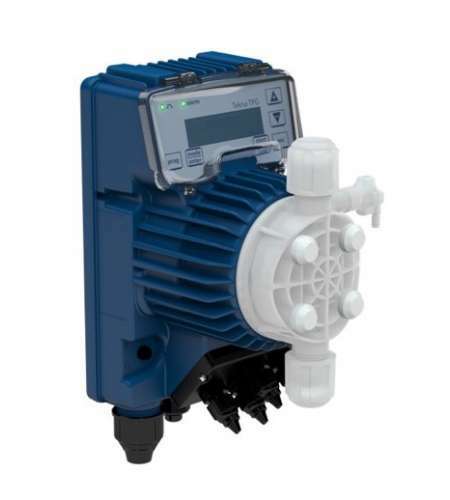 Digital dosing pump with constant flow rate that can be manually adjusted or proportional flow rate according to an external analogue (4÷20 mA) or digital pulse signal (e.g. from water meter). This digital version of the APG, includes additional characteristics: timer function, ppm dosing, statistics, password and On/Off input (remote switch). Tekna TPG Series is equipped with a manually priming pump for the start up. The pump is furnished with a complete standard installation kit, which includes: PVDF foot filter and injection valve, PVC suction tube, PE delivery tube. A PVDF-T installation kit is available on request. Also available with a pump head in AISI316L which provides very high chemical compatibility with several liquid ends.